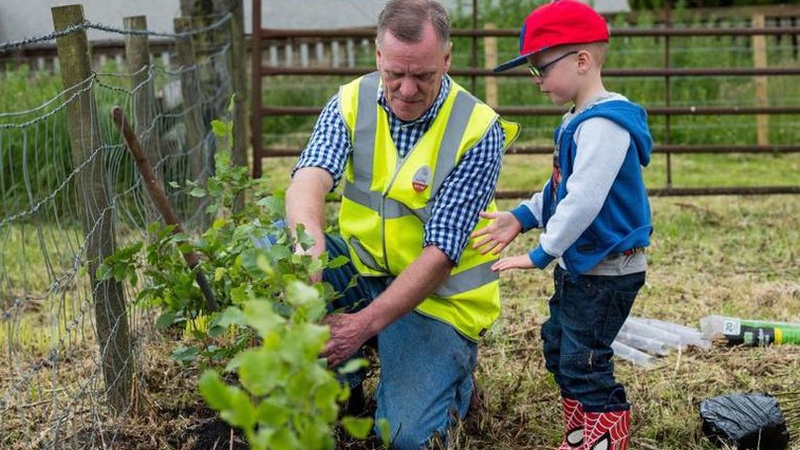 Caledonian Estate near Kirkintilloch recently opened its gates to over 300 members of the public for the first LEAF Open Farm Sunday' event on Easter Cadder Farm. Easter Cadder was one of hundreds of farms across the country which welcomed visitors as part of the farming industry's annual open day. Activities and live demonstrations on the day included; machinery, livestock and arable cropping displays, a casting demonstration, fishing display, and gundog presentation. The event, which was organised by Galbraith and CBRE, not only gave visitors an insight into the world of farming and estate management but showcased the good relations and effective partnerships between landowners, tenants, contractors, employees and the wider public. Caledonian Estate is a fairly unusual estate due to its urban-fringe location on the outskirts of Bishopbriggs, less than five miles from Glasgow. Whilst this can provide the estate with some additional challenges such as increased rural crime and fly tipping, it also offers a wealth of opportunities. The estate has seized several commercial opportunities by engaging entrepreneurial individuals and organisations to maximise the use of the estate assets and its location. These have included the lease of land for a waste recycling plant, a golf driving range and a commercial lease to a children's care home charity to name but a few. The Coast House Trust, a local charity who offer rehabilitation workshops in art, gardening and woodwork, also lease the Buchley Eco Centre from the estate, where they collect garden waste and turn it into high quality compost. As Caledonian Estate is one of the major landowners in the East Dunbartonshire area, Galbraith help to maintain the estate's positive relationship with the local authority through regular meetings to the benefit of both parties. For example, Caledonian Estate granted a lease to the local authority for temporary salt storage whilst the council built their new snow dome. We were thrilled to host the estate's first LEAF Open Farm Sunday on Easter Cadder Farm last weekend. There are countless individuals, organisations and groups involved in the day to day running of the estate and this was very apparent to all the visitors at the event. Their hard work and commitment is the reason the land remains so productive and well utilised, the estate's survival depends on them and this in turn has a positive effect on the local economy and community. The exemplary relationships the estate enjoys with its tenants and neighbours was clear on the day. Nearby farms which did not host Open Days' of their own provided livestock, conducted demonstrations, helped with the setup and arranged for the Royal Highland Education Trust (RHET) to host a stand. The estate's farm contractors, the Wilson family, form an integral part of Caledonian's management team and played a key part in the event's success. The Wilsons, together with estate tenant James Rankin and the estate maintenance team, led by foreman Graham Robson, were all instrumental in getting the day set up. It's been a delight to be involved in the event and I believe it's really highlighted to the public how effective good partnerships on estates can be.